Acrylic on 4 pieces of 24" x 32" plexiglass. Date: Feburary 2018. 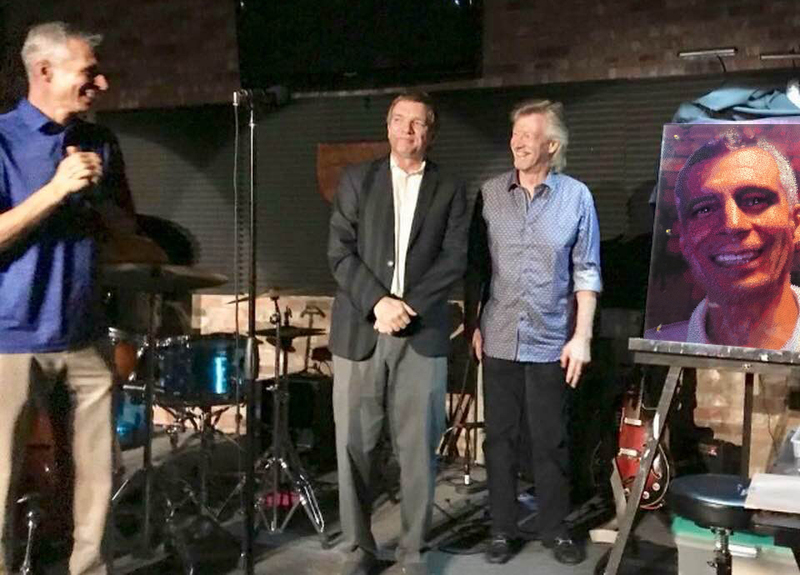 In early January 2018 I was asked by Boris Garbe, the Visual Arts Chair of the Timucua Arts Foundation to be the artist on stage during a Timucua Sunday concert. "So Mr Shirk. Would you like to paint live on stage at the Timucua Arts Foundation? Benoit has requested a cool and sophisticated Artist to accompany Georgio Valentino on Feb 25. I thought of you immediately." So what would I paint? At the time I didn't know much about the Timucua Arts Foundation, or Benoit Glazer, it’s founder and the Musical Director of Circus du Soleil - 'La Nouba'. I decided to do some research and maybe something would come to me. 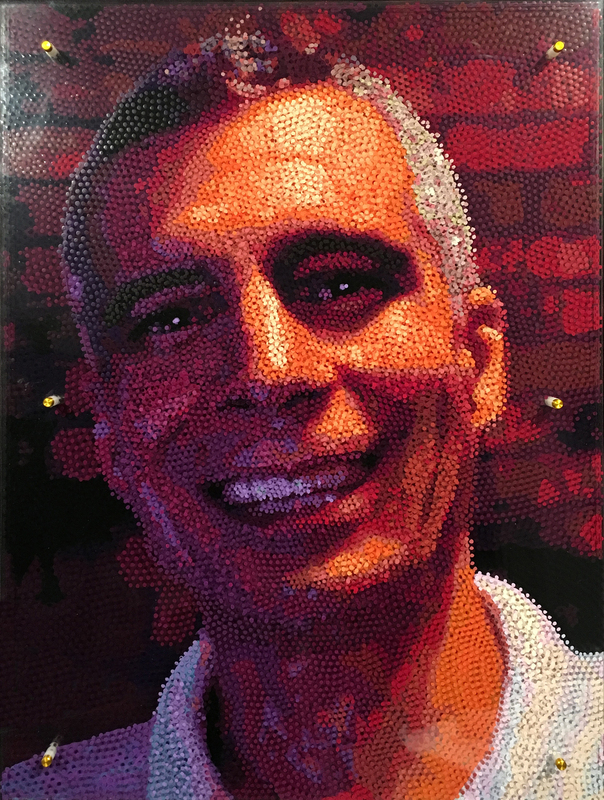 The more I learned about Benoit Glazer, his family, and their contributions to the local artistic community, the more I was sure the painting should be a portrait of Benoit. I found the perfect image of him to paint while watching the documentary about the origins of the Timucua Arts Foundation called "The White House Overture". 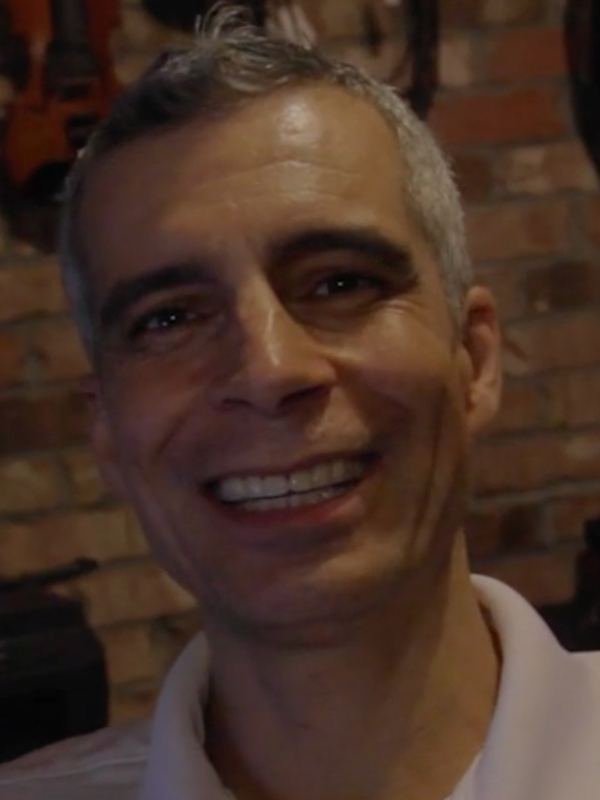 Screen shot of documentary image used for Benoit Glazer portrait. 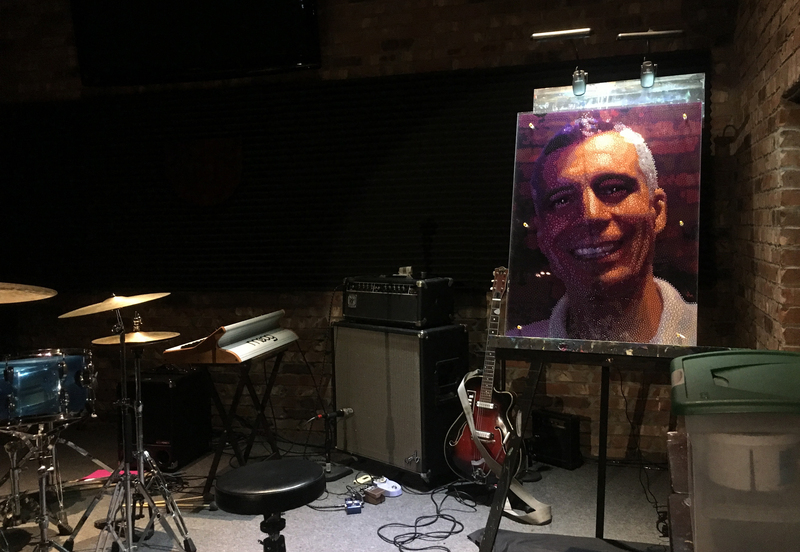 With a twinkle in his eye, the painting shows Benoit with dramatic lighting in front of the warm earthly Chicago brick that is the backdrop to his living room stage, and also prominent throughout his home. 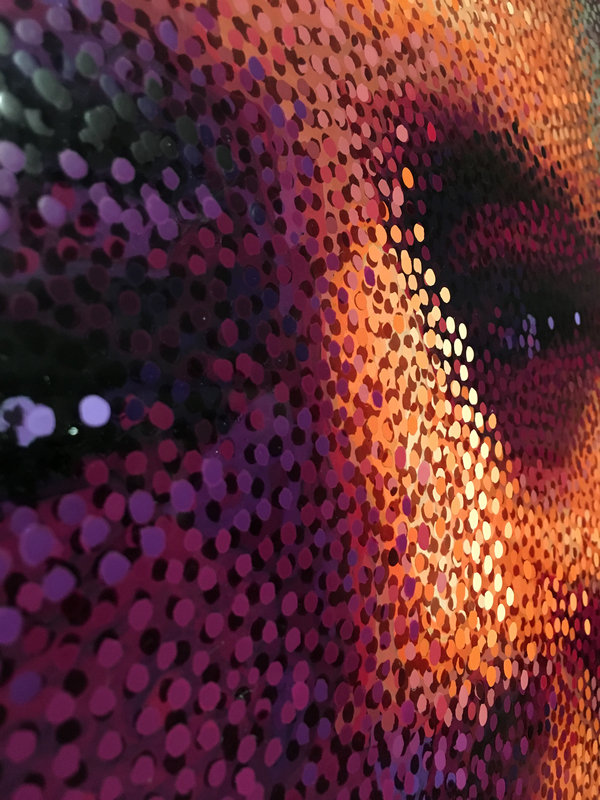 The painting uses acrylic paint on 4 sheets of plexiglass. Each sheet contains a part of the final image. The effect creates a 3 dimensional kinetic image that moves and changes as the viewers perspective changes. 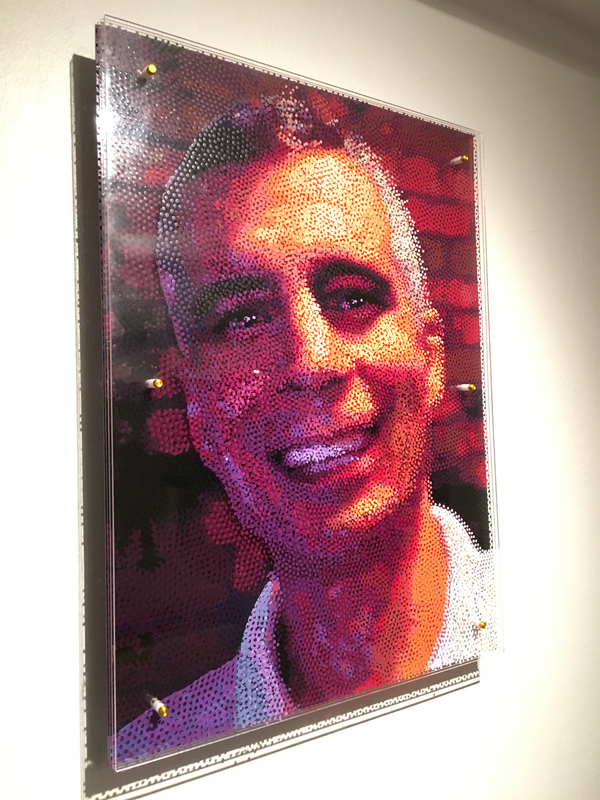 Here is a short 1 min video that shows what is printed on each of the 4 sheets of plexiglass for this painting. What an exciting night at the Timucua Arts Foundation. I was on stage performing with art-rock singer and gothic crooner Georgio Valentino. My part of the performance was finishing the portrait of Benoit Glazer. Thank you Boris Douglas Garbe for giving me this fantastic opportunity. So much fun. I even had my own rooting section of lovely friends up in the peanut gallery, Lillian Verkins, Lisa Lisa Serendipity, Denise Fix, Linda Saracino, Ev Niewoehner, and Kevin Wood, and of course The Lovely Loleita. Thank you Lillian for putting on such a wonderful pre-concert party. The whole peanut gallery was at the party warming up as well as, Vickie Wilson Wilson, Ronda Richley, Virginia Arakelian, and many more. Thanks Josiane Barthe Pinkcombe for showing up for the show with that crazy guy that followes you around everywhere. What a delightful surprise.